The legislative session in Georgia is coming to a close. Support to fund additional Medicaid waivers was nominal. After learning that the House approved no funds for supported employment I was disheartened. Fortunately, a week later, the Senate voted to appropriate $980,000 for supported employment. If approved by the Conference Committee, these funds will provide support for 125 people with intellectual and developmental disabilities (DD) to work in an integrated setting. Supported employment is critical in helping people with developmental disabilities find and keep a job. A job coach works closely with their client in finding a job that is of interest to the individual in addition to a job that utilizes the individual’s strengths and gifts. Furthermore, a job coach trains the employee, works with the employer to provide job adaptations and accommodations, provides on-the-job coaching and ongoing follow-up and support. Over 80% of adults with intellectual disabilities are not employed. An estimated 63% of people with a DD, ages 18-64 who are unemployed want to work. 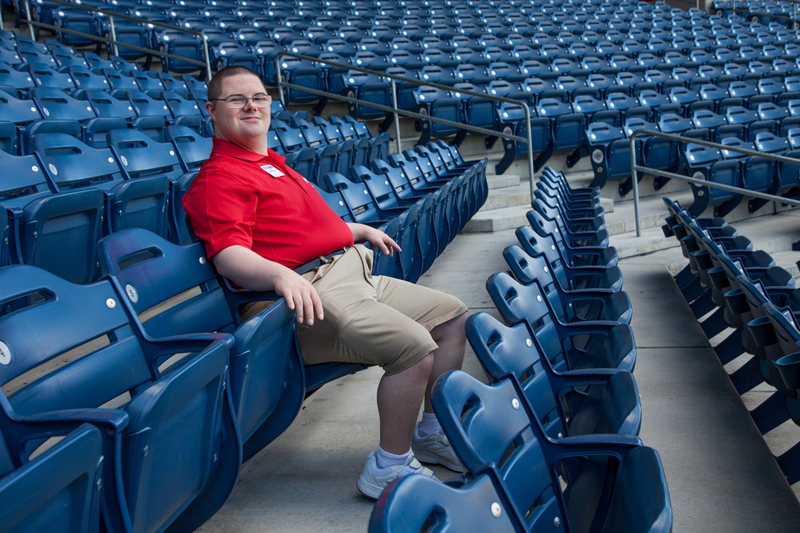 Last summer, I photographed Patrick working at a Gwinnett Braves game. Funding for a job coach made it possible for Patrick to secure this job. In the absence of support Patrick would have been relegated to sitting in the stands instead of doing what he valued most, working and taking home a pay check.